in “Theosophy World”, October 2004.
magazine, Canada, Spring 2005, p. 19. As a student I firmly think theosophy is healthier than it has ever been – mainly because it is achieving what the several Initiates who came together to initiate its activity in 1875 intended to accomplish. That one among the “several” who founded the impulse became the Manu for the cycle so founded – not in the anthropomorphic sense of “he did it”, but as viewed in “Keynote of Consciousness”. A nucleus of universal brotherhood can only begin its accumulations, when a body of literature potent with the magic of self-reform for those who assimilate it, is made available. Helena P. Blavatsky agreed to be the scapegoat or “seed” by which the new Keynote of Consciousness could be made present and available on a lower plane. The process corresponds to planting a seed. The seed has to be dead (i.e. dried out and having no life from the cycle in which it was harvested). Then it can be planted, sprout underground, and undergo a second death. All this is for Cyclic Law. In the East the word for it is: Padmapani (A Protector of the Cycles). Thus the most important part of Helena Blavatsky’s work was unseen, for events germinate in the astral before they sprout above ground into the noisy, boisterous world we inhabit. The work was prenatal, and we students of history are privileged to read the vast array of changes proceeding in the cosmic womb: first to America for collecting the past and planting on fresh ground, then to India for denial, crucifixion, and expulsion; then to Italy, Germany, and England for purposes of beginning “a new movement in the West”. Yes, the Movement is healthy as never before, and I have yet to meet a genuinely serious student of the Blavatsky-material who does not show the marks of real occultism. 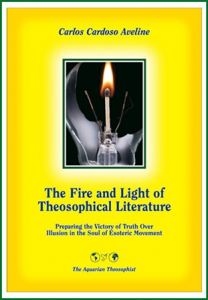 Jerome Wheeler founded “The Aquarian Theosophist” in 2000 and was its editor up to 2006.